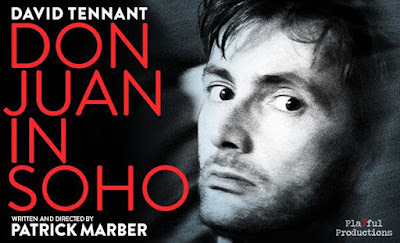 David Tennant returns to the West End in March 2017 to play the title role in Patrick Marber’s Don Juan in Soho. The production will preview at Wyndham’s Theatre from 17 March 2017, with press night on 28 March 2017. It will complete its strictly limited eleven week run on 10 June 2017. Tickets go on public sale today, 2 November 2016, at 1pm. Patrick Marber’s plays include Dealer’s Choice, After Miss Julie, Closer, Howard Katz, Three Days in the Country and The Red Lion. His film credits include Closer (directed by Mike Nichols), Notes on a Scandal (directed by Richard Eyre), Old Street and Love You More. For television his co-writing credits include The Day Today and Knowing Me, Knowing You With Alan Partridge. In December this year Ivo van Hove will direct Marber’s new version of Ibsen’s Hedda Gabler for the National Theatre starring Ruth Wilson and Rafe Spall. As well as directing a number of his own plays his other directing credits include Travesties by Tom Stoppard currently playing at the Menier Chocolate Factory and transferring to the Apollo Theatre in February next year, The Caretaker at the Comedy Theatre, Blue Remembered Hills at the National Theatre,‘1953’ 'by Craig Raine at the Almeida and The Old Neighbourhood by David Mamet at the Royal Court Theatre. His plays have won Evening Standard, Olivier, Time Out, New York and London Critics’ Circle and Writers’ Guild awards. His TV work has received BAFTA, British Comedy and Royal Television Society awards. His screenplays have been nominated for Golden Globe, BAFTA and Academy Awards. He received the British Independent Film Award for Notes on a Scandal.